The University of New Brunswick was awarded the Mayor’s Environmental Award tonight during a City Council meeting at Fredericton City Hall. 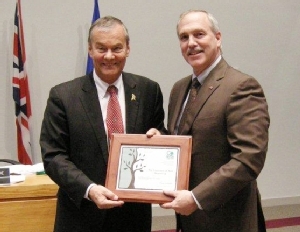 The award was presented to Dr. Tony Secco, UNB's Vice-President (Fredericton), for UNB’s continued stewardship of the city’s protected wellfield area. It is so important that we honour those in our community that are helping with our effort to reduce greenhouse gas emissions and become a more sustainable community,” said Mayor Brad Woodside. The City of Fredericton’s drinking water supply is protected under the New Brunswick Wellfield Protected Area Designation Order – Clean Water Act. The UNB campus is located in Zones B and C of the Fredericton Wellfield Protected Area and represents one of the largest properties in the area. There are 35 buildings under protected regulations, from which 31 petroleum storage exemptions were issued as well as eight chemical storage exemptions involving development projects on the campus such as the CURRIE Centre and the new NBCC building. A Wellfield Protection Engineer was hired by UNB prior to designation and accomplished a significant effort to move the process along. GEMTEC Limited and Stantec were contracted to provide in-depth storage reports at significant cost to the university. At the same time, the University embarked on a considerable exercise to consolidate their storage volumes by removing inventory that was no longer required and reducing volumes to levels more approving towards the protection of the aquifer. Hazardous chemical disposal also represented a large cost as the chemicals and materials concerned must be hauled away by licensed disposal companies and cannot be put into the landfill. For the remaining inventories that exceeded the volumes permitted under the wellfield regulation, UNB has installed protective measures such as secondary containment as required under their exemptions. Alterations to the petroleum storage system at the Central Heating Plant were also noteworthy with replacement of the large Bunker C tank and alterations to other storage tanks and piping systems.